Check This Out - The Easy Way to Beat Your Mortgage! Watch the Channel 7 Report to Discover how to Check Your Mortgage for Errors, Cut Years Off Your Loans and Crush Your Debt! Hidden bank errors could be costing you thousands of dollars on your mortgage and you may never know it. 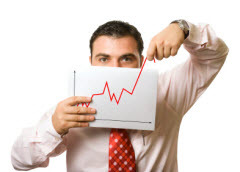 Mortgage crushing strategy releaved - cut years off your mortgage and save thousands! Break-through software, Home Loan Manager Pro, helping savvy homeonwers crush their debt and find hidden errors. 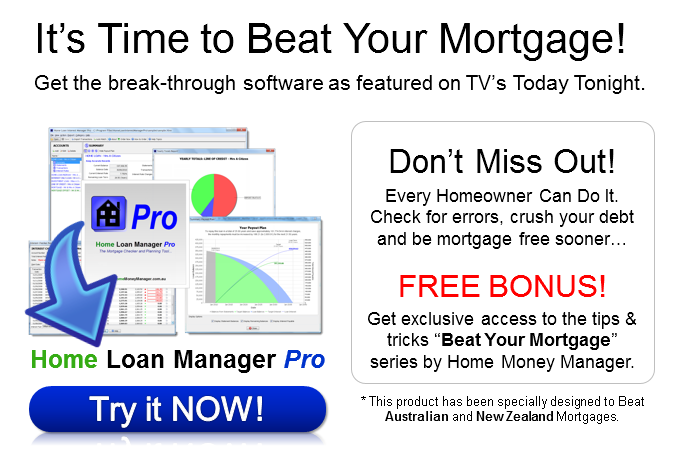 Get the break-through mortgage software featured on the Channel 7 Today Tonight report! The Australian Mortgage Checker and Planning Tool EVERY Homeowner Must Have! Don't let the bank get away with it! Get instant FREE access to the Home Money Manager "Beat Your Mortgage" tips and tricks masterclass series built from 10+ years of helping Australian homeowners. Discover insider secrets the banks don't want you to know about your mortgage! 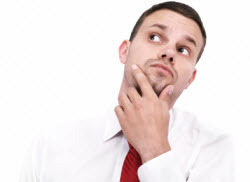 Do Banks Really Make Mistakes? 889,000 clients more than $184.5 million!" "Commonwealth Bank will pay refunds to 216,000 customers for failing to honour discounts on mortgage interest rates and fees that it had promised, mistakes that meant borrowers were overcharged ... which date as far back as 2008." "The Bank of Queensland will refund customers $34.5 million after it discovered it had incorrectly applied interest rates and fees. The bank says about 4 per cent of its customers were affected by the errors, some of which date back to 2004." "About 235,000 ANZ home loan customers will receive refunds totalling roughly $70 million after being overcharged for interest repayments ... errors that in some cases date back to 2003." "UP TO 40,000 Westpac customers are set to share an $8 million refund package after the bank discovered they had missed out on certain discounts that should have been offered to them when they signed up to a specially tailored mortgage offer." "Bankwest, a division of the Commonwealth Bank of Australia, has refunded $4.9 million to 10,800 customers after it failed to take into account customers' offset accounts when calculating interest on home loans." "There was money missing from my account which even though I put there, they said never really existed ... for some reason lost the money I had in my home loan re-redraw. Now says $0. Just like that. Not happy. I told them it was theft." The Facts You Need to Know to Beat Your Bank! All of Australia's largest lenders have been caught overcharging clients millions of dollars. An error on just your loan is unlikely to be noticed as it is too small for the bank to pick up. A simple typing mistake or computer glitch is all it takes. Your mortgage repayments have been set up to maximise the amount of interest you pay over the life of your loan, generating easy profits for the banks. You will repay 2 to 3 times the amount you borrow if you don't make extra repayments on your mortgage. After 22 years of repaying your mortgage, you will still owe the bank more than 1/2 of the original amount you borrowed. Commissioner Hayne's latest findings summed up the bank's actions as "Too often, the answer seems to be greed - the pursuit of short-term profit at the expense of basic standards of honesty"
Why Check for Bank Errors? Bank errors can happen at any time over the life of your loan (and more than once! ), and if left undetected even the smallest of errors can compound away adding thousands of dollars to your loan repayments. Imagine how surprised Lyndsey was when she started using Home Loan Manager Pro and discovered that her offset account had NOT been linked to her mortgage. If left undetected the error would have cost Lyndsey an extra $20,576 in interest charges, as all of the money she was putting into her offset account was being ignored by her bank. Luckily she found the error and was able to go to her bank, point out their mistake, and get a full refund. Hemil from Brisbane in QLD found his initial rate was set to 5.14% instead of 5.04%. Michelle from Joondalup in WA found that $10,823.47 she had made in extra repayments over the past 2 years hadn't been applied to her loan correctly. Quoc from Croydon in VIC found his lender had incorrectly calculated his interest charges. Matthew from Perth in WA found that a 0.75% discount agreed with the bank had not been applied to his investment loan. On an average balance of $177,000 the bank would have overcharged him over $39,325 in extra interest if he had not found the error. These errors have now all been fixed - but only after the clients found them. So if you have never checked you bank statements for errors, download Home Loan Manager Pro today and make sure you are not paying your bank a cent more than you have to. "Since August 2010, the big four banks have experienced nine technical glitches in their payments systems..."
Signing up for a mortgage is one of the biggest financial decisions you will ever make, and with a little planning and discipline you can turn it, and your home, into one of your most successful long-term investments. We let the bank calculate our interest charges and fees. But, what if the bank gets it wrong? We all make mistakes, and your lender is no exception. A simple human error or computer glitch can add thousands in interest to your mortgage if left undetected. And what if their repayment schedule isn't right for you? Lenders want you to pay off your mortgage over the full term, maximising the amount of interest you pay on your loans. With so much of your money at risk, should you really be letting someone else manage your mortgage? "Past surveys have shown a high rate of calculation errors in home loan statements by lenders. There is no such thing as a perfect system, mistakes are a fact of life and that's why you should keep a close eye on your home loan ..."
Take Control In 5 Easy Steps! Pay off your mortgage faster by setting goals and locking in your target - see exactly how much you can save, and know how much to repay every step of the way until you are debt free. 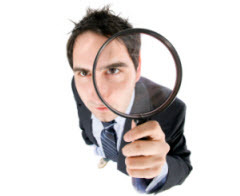 Check for hidden bank errors and protect the thousands of dollars you pay in interest each year. Make informed decisions by performing what-if analysis on interest rate changes, extra deposits, offset account balances, interest calculations, and much more - instantly seeing the impact on your loans. Discover the true cost of your mortgage, year-to-year and statement-to-statement, keeping you on track and motivated to crush your debt. Accurately track and record all your loan details in the one convenient location, making it easy to track and monitor your mortgage. The two main ways to save money on your mortgage are to make extra repayments (so you can get ahead and reduce your interest charges) and to check for hidden errors (to make sure the banks aren't dragging you backwards). In the software getting started videos we'll show you how we saved over $165,000 in interest charges on a $300,000 mortgage just by using these two simple techniques. The videos come free with the software and you can watch them right now. You'll also learn how to take control of your loans, set up a plan to cut five years off your mortgage, and check your loans for hidden bank errors. "I have made some additional repayments and I was trying to see the effect this has on the reduction of the term of the loan ... after running the increase repayments report it gives me exactly what I want. Great job." 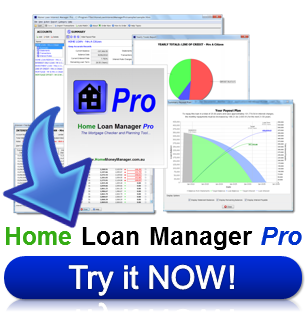 Why Home Loan Manager Pro? A solution that works with all Australian mortgages and with all mortgage reduction strategies. The QUICKEST mortgage checker in Australia. Using our unique import wizard you can instantly load your mortgage details available from your Internet banking site. Innovative and fast - minimal typing! The #1 Ranked "Mortgage Audit Software" on all major search engines around the world including Google, Yahoo, and Microsoft Bing. Easy to get started. Full video tutorials to help you every step of the way, showing step-by-step how to get started, and how to get the most out the software in the quickest time possible. A complete mortgage solution that will help you check for errors, set goals and chart your progress as you pay down your mortgage, scenario plan and informed decisions, show you the true cost of your loans, and help you keep all you loan details in the one convenient location. Less than 5 minutes a year is all it takes to manage your loans and stay one step ahead of your bank. Once you've loaded your loan details simply run the reports! Proudly 100% Australian made - professionally built, impeccable quality. Safe and secure - the software and all your mortgage details are stored locally on your computer (not on a website or web server), so only you have access to them - and you can password protect all your details for added security. 100% Free Trial. Try Home Loan Manager Pro for free and take it for a test drive with your loans. No credit card required, no fine print, no postage and handling - Simply download, install and try it free. 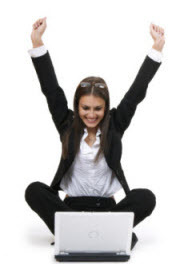 "I have been a user of the Home Money Manager software now for over 7 years, and absolutely love the program! Prior to installing this program, I had looked at a variety of other options, but none met my needs like this one did. It's simple to set up, easy to use and super reliable. Alongside this, the customer service is awesome - it's responsive and personal and is a great match for a great software product. Highly recommended. This is genuinely how I feel about the product and your service ... Thank you Matthew and team." It's never too late to review your mortgage and start planning for the future. Download the software now, check your loans for hidden bank errors, and set up a payout plan to see how much you can save when you cut five years off your mortgage. Best of all the software does all the hard work for you and you can use the import wizard to load your loan details from your Internet banking site - so you can get the job done in minutes. Want to find out more about the software?